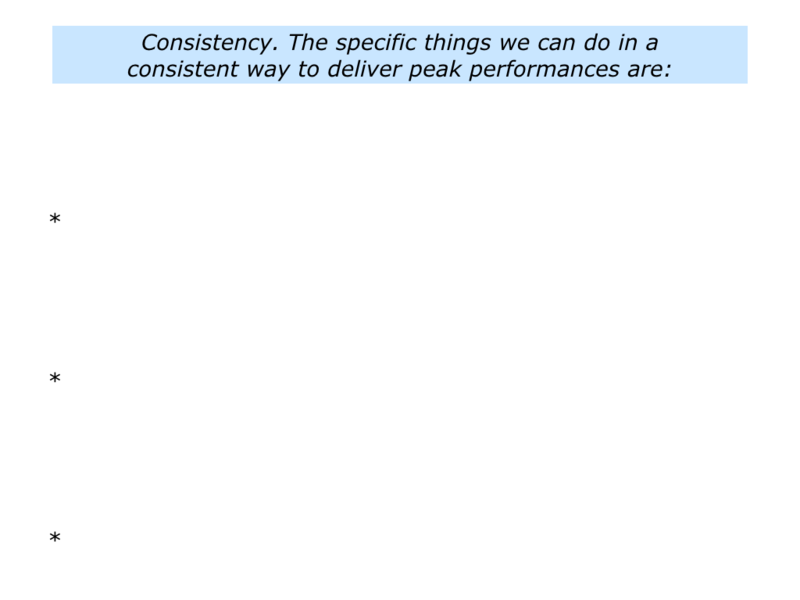 There are many models for achieving peak performance. One approach is based on the steps taken by great players and teams in sports. Such athletes aim to control themselves, their performance and the game. 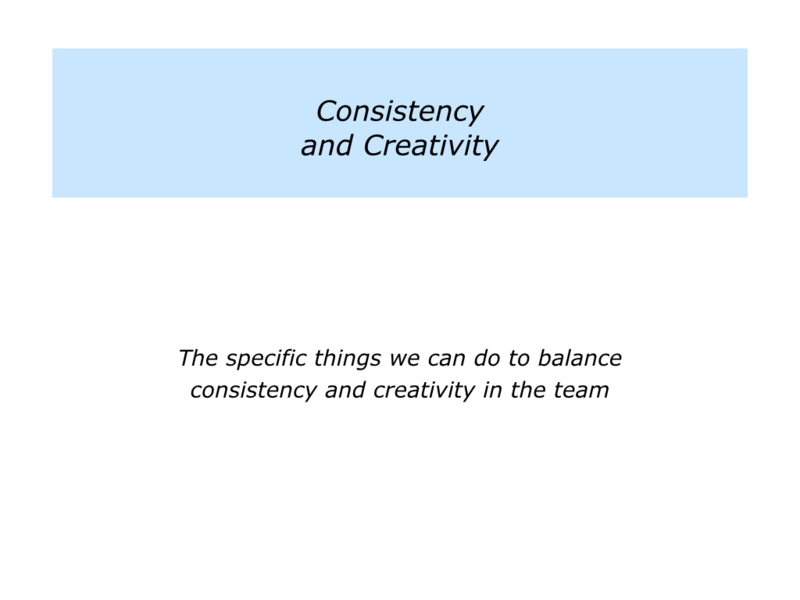 They then focus on clarity, consistency, creativity and concrete results. That sounds simple in theory, but how do people actually make it happen? 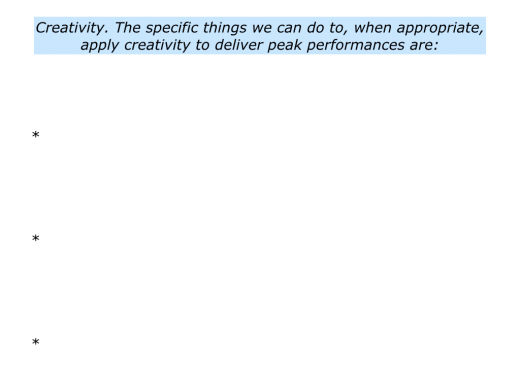 Here is one approach they take to making the best use of their talents. 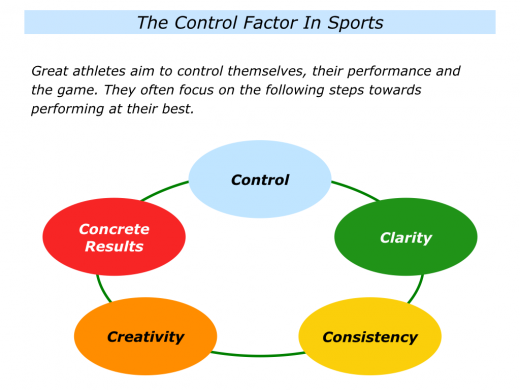 Great athletes start by aiming to control the controllables. They can control their attitude, their preparation and their professionalism. They cannot control the weather, the other athletes or the spectators. 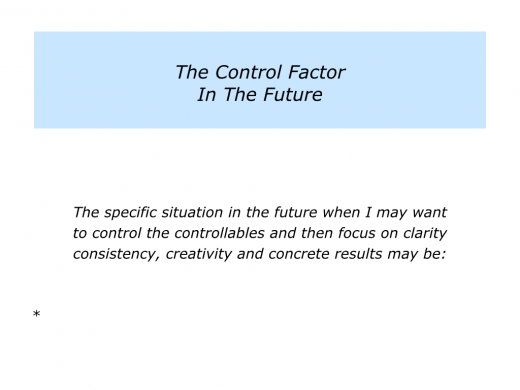 They aim to build on what they can control and manage what they can’t control. Many start by learning how to control themselves. Such people are often passionate and adrenalin driven. When they are in the zone, however, they are calm and rise above the congestion around them. Don Greene is a coach who helps performers to demonstrate grace under pressure. He works with people in sports, music and many other fields. Here is an introduction to how he helps musicians to stay calm when performing. You can discover more via the following link. Great athletes aim to be in control of the techniques they use in their chosen activity. They learn how to control the football, golf ball or whatever. To control their own performance. To control their part of the arena. Great sports teams, for example, have controllers that dominate each part of the arena. They aim to set the agenda, steer the strategy and enable the team to achieve success. Great athletes have clarity regarding the strategy for achieving the goals. They do this whether playing individual sports, such as golf or tennis, or team sports. Bill Walsh, the legendary coach of the San Francisco 49ers, described this approach in The Score Takes Care of Itself. He believed that leaders must develop the right strategy for delivering success. This included planning for tackling various scenarios. The motto of the Boy Scouts, ‘Be prepared,’ became my modus operandi, and to be prepared I had to factor in every contingency: good weather, bad weather, and everything in between. Bill followed the 80/20 rule. The 49ers focused on maximising the 80% they could control in a game. There may be 20% they couldn’t control, such as a referee’s call, a bad bounce or fortune. Players were expected to practice relentlessly, however, until their execution at the highest level was automatic. Bill called this ‘routine perfection’. Delivering these standards on the field vastly increased the team’s chances of success. Eventually – within months, in fact – a high level of professionalism began to emerge within our entire organization. I moved forward methodically with a deep belief that the many elements of my Standard of Performance would produce that kind of mindset, an organizational culture that would subsequently be the foundation for winning games. The culture precedes positive results. It doesn’t get tacked on as an afterthought on the way to the victory stand. Champions behave like champions before they’re champions; they have a winning standard of performance before they are winners. Have you noticed that … great players and great companies don’t suddenly start hunching up, grimacing, and trying to ‘hit the ball harder’ at a critical point? Rather, they are in a mode, a zone in which they’re performing and depending on their ‘game,’ which they’ve mastered over many months and years of intelligently directed hard work. 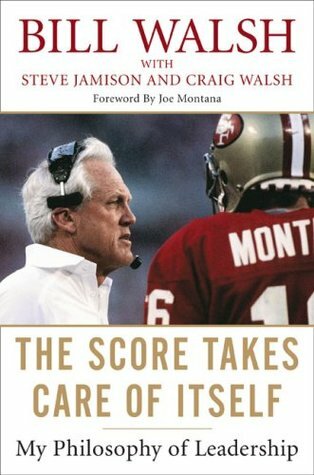 By focusing strictly on my Standard of Performance, the 49ers were able to play the bigger games very well because it was basically business as usual – no ‘try harder’ mentality was used. In fact, I believed it was counter-productive. Consequently, the San Francisco 49ers could function under tremendous stress and the forces that work on individuals in competitive situations. The team dealt with pressure situations by continuing to do the basics. They could then add the brilliance. 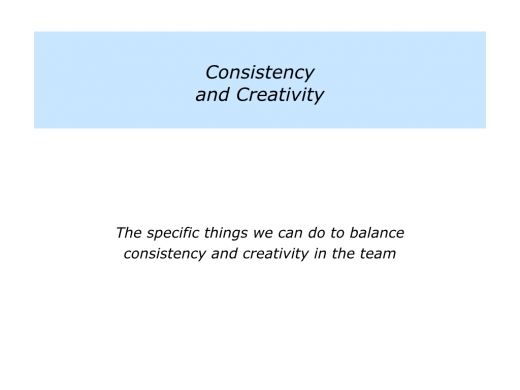 Great teams get the right balance between consistency and creativity. They consistently reach 8/10. But they also encourage people to express their talents so that the team reaches 10/10. Imagine you are a leader and want to build such a team. One concern you have, however, is that people sometimes neglect the basics on their route to self-expression. If you wish, gather people together and invite them do an exercise on this theme. Invite people to do the following things. 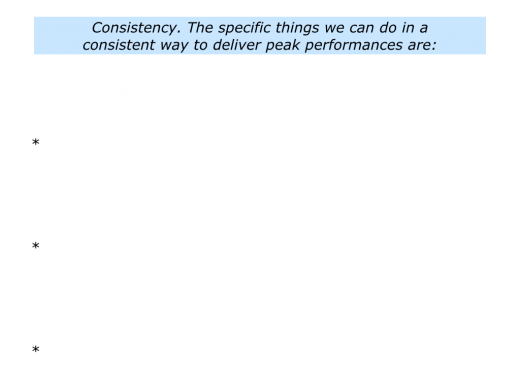 Describe the specific things people can do in a consistent way to deliver peak performances. 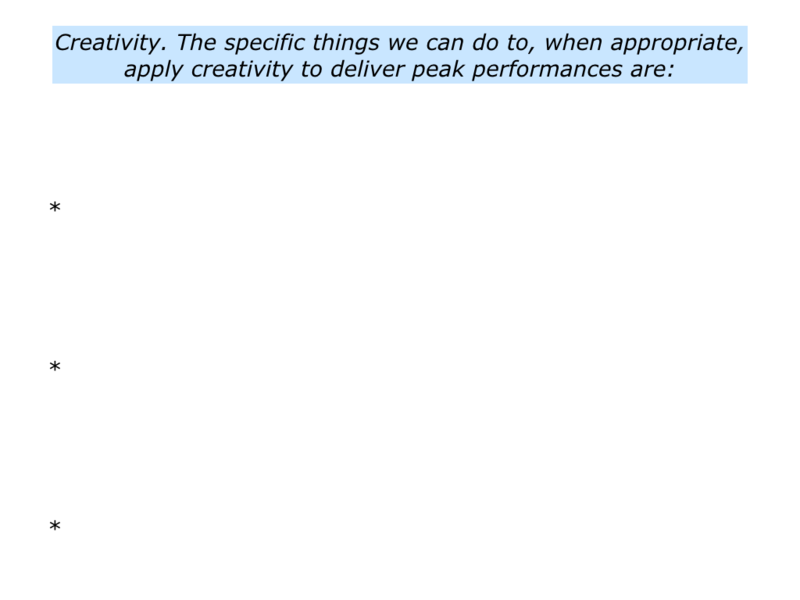 Describe the specific things people can do to, when appropriate, use their creativity to deliver peak performances. This exercise can be used with all kinds of teams. During the 1980s, for example, I used it with teams of talented young soccer players. Attack in the final third of the field … Deal with dangerous situations in defence … Make decisions about things not covered in the game plan. Here is the exercise you can invite people to tackle. Different players have different philosophies regarding how they aim to deliver positive results. Some players reframe situations as ones where they aim to do their best. They believe that, providing they do this, the score will take care of itself. They focus on harnessing their inner Champ. They follow the principles they have pursued previously to deliver their equivalent of championship performances. They also add any other skills required to deliver their goods. Such players also manage what Steve Peters called their inner Chimp, any negative self-talk or habits. 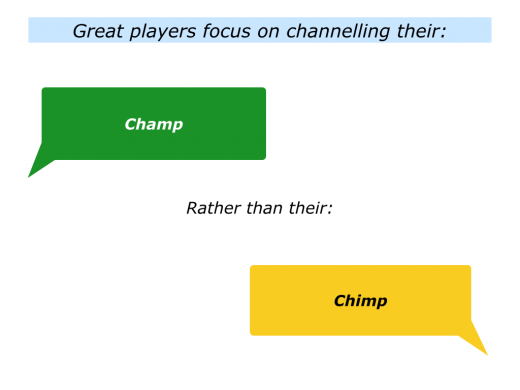 They build on their Champ, rather than get distracted by their Chimp. You can discover more about this approach via the following link. Some players focus exclusively on winning. Whilst this seems obvious, it can also be counter-productive. People can be overcome by neurosis and find their game falls apart. Great players often follow the old cliché. They aim to play their own game, rather than play the occasion. They aim to keep doing the right things in the right way. There are many ways to do fine work. One approach is to apply lessons from focusing on the control factor in sports. 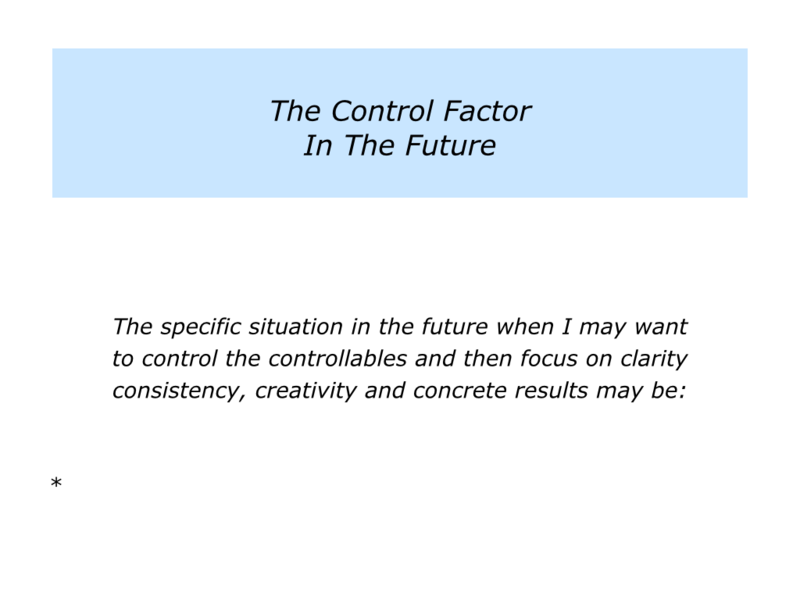 Describe a specific situation in the future when you may want to control the controllables and then focus on clarity, consistency, creativity and concrete results. 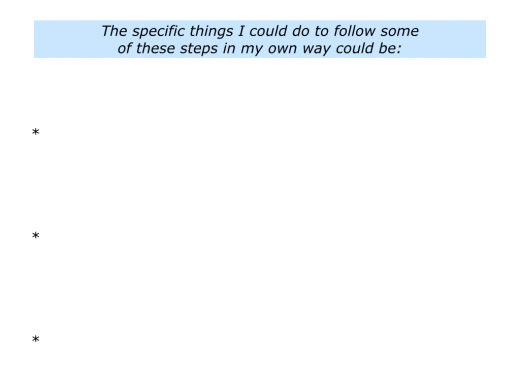 Describe the specific things you can do to follow some of these steps in your own way. 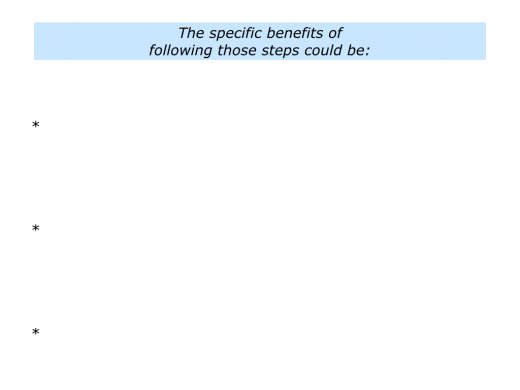 Describe the specific benefits of following those steps and doing your best to achieve the desired results.